Bali Collections is a shopping, entertainment, dining center nestled inside Nusa Dua Bali's gated resort community. The center's opening hours is from 10:00 am to 10:00 pm everyday. They have a free shuttle service pickup and drop off every hour from the resorts within the Nusa Dua's resort community. It took me a lot of marketing strategies just to get my husband to agree to visit the Bali Collections. Why not since we're already in Bali, right? Ahahah! The shuttle service to the center was for free. I love free stuffs. I mean who doesn't. As I've mentioned above Bali Collections is a center for shopping, dining and entertainment. There are many things to do here such that you can forgot about the time. On the first night we visited the area, we went for massage and finished past 10:00 in the evening (no more free shuttle service). We hired a van to get us back to the resort for Rp. 30,000.00. 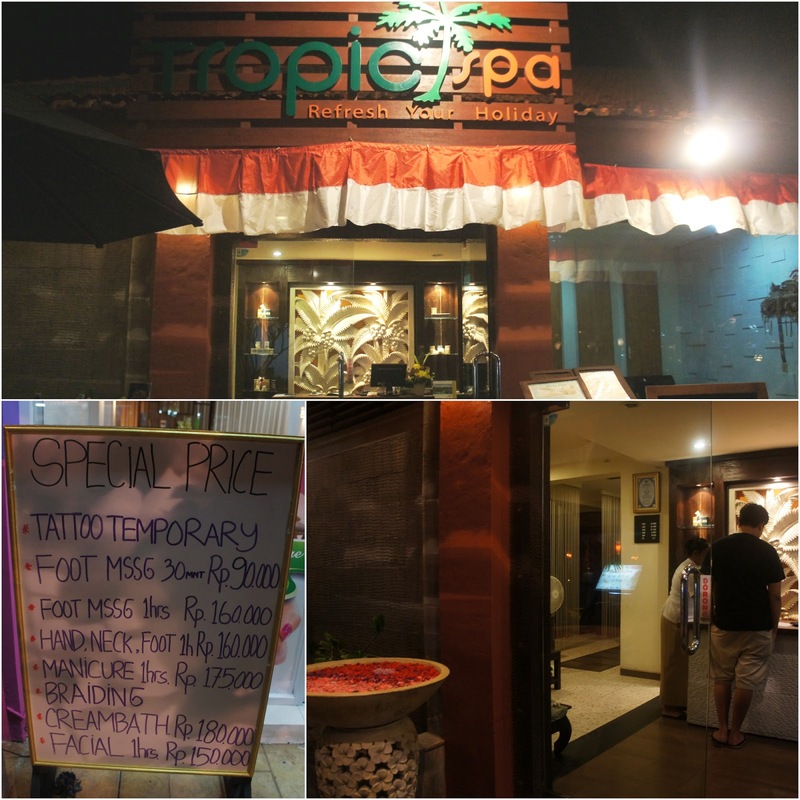 Later we found out that the resort is just a short walking distance from Bali Collections. Ahahah! Anyway here are some of the things you can do while visiting Bali Collections. It's hard not to get tempted by the fresh seafood displayed in front of the restaurants at Bali Collections. So me and hubby decided to dine here on our 2 night. We dined at Coco Bistro Restaurant.The price is very reasonable and the food is very good. They offered a giant plate full of seafood with rice good for 2 persons and we only paid Rp. 528,770.00 including the drinks we ordered. I'm not a massage fanatic, we'll until I've met my husband. He loves a good massage and so he rubbed it off one me. We checked out the offers at Bali Collections and we find them very cheap at Rp. 160,000.00. We didn't hesitate to schedule one on our first night. We love the massage so much that we decided to come back again on the second night at Bali Collections. I would say, Bali is one of those places that offers very good massage services. We also tried it on the resort's Spa and it is also as good. But the one offered at Ayodya Resort Bali is a bit pricey compared to that in Bail Collections. So don't miss it out on your visit to Bali. Above photo on the lower right shows my hubby shopping for the best massage deal at Bali Collections. I was surprised that most of the stalls here sells branded stuff. It's really a tourist haven. Everything is sold here from clothes, to swimwear, to paintings, shoes, food, souvenirs and a lot more. There's also a spot at Bali Collections wherein 3D rides are offered. It's just crazy! Ahahaha! If you're into it then you'd definitely love it here. Don't miss out on my Travel Guide to Bali, Indonesia from this link.